Baptism is an important ritual in the life of the church. Through the waters of baptism, we are initiated into the family of God. It is a reminder of God’s faithful love for God’s people throughout all of time. It is a covenant that God has initiated with the church that lasts a lifetime. Over the past few weeks, I’ve been contacted by several families asking about baptism for their children. As United Methodists, we affirm this covenant and how God invites all persons regardless of age, race, status or gender to receive the gift of baptism. On September 30th between the 8:30 and 11 am worship service, we will hold a special baptismal celebration for those desiring the sacrament of baptism. If you would like to be baptized on September 30th, please follow this link. During this celebration, we will have a moment for those who have already been baptized to reaffirm their baptismal covenant as we welcome these new brothers and sisters into the family. I am looking forward to this special day in the life of our church! Volunteer Appreciation Sunday! August 26 during Sunday School! I'm always excited for Sunday. It's a chance for us to gather as a church family and celebrate the great love of our Savior Jesus Christ! But this Sunday is an extra special Sunday! Did you know, that as a church, we have AT LEAST 33 different ways that our church members can volunteer? That nearly blew the staffs mind as we ticked off all of the various ministries that YOU make happen! Whether it's helping out with Our Daily Bread, the Tech team, our newest ministry The Tri-County Shepherd Center, teaching Sunday School or on Wednesday night... see the list goes on and on! As your pastor and from the staff of Royse City First United Methodist Chuch, we want to say Thank you! Thank you for using your gifts and graces to make the church a place where all people can come and experience the love and grace of Jesus Christ and become His Disciples. As we say thank you, we have a special invitation for you! This Sunday, between the 8:30 and 11:00 am services, the staff would like to host a volunteer appreciation extravaganza! The staff has been working hard to create little gifts, provide snacks and beverages and yes a short program to let you know that WE APPRECIATE YOU! So if you worship at the 8:30 service, we invite you to come over to Wesley Hall after worship, and if you worship at the 11:00 service, we encourage you to show up around 9:50 so we can celebrate you! 1 Corinthians 12: 4-6 reminds us, "There are different kinds of gifts, but the same Spirit distributes them. There are different kinds of service, but the same Lord. There are different kinds of working, but in all of them and in everyone it is the same God at work." 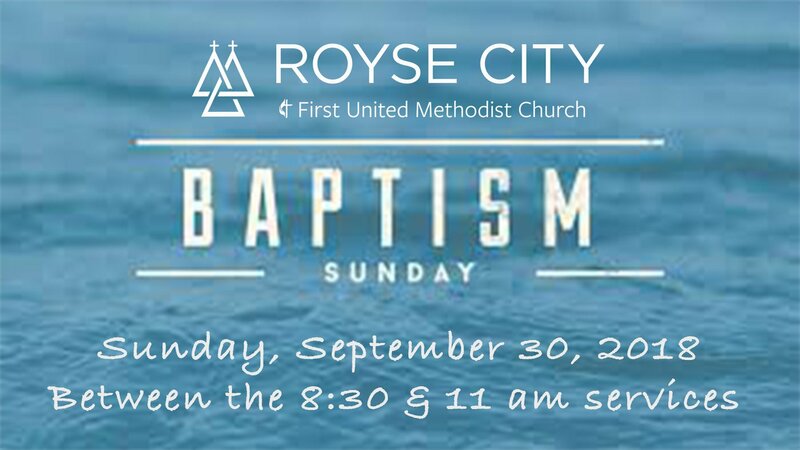 As your pastor and staff of Royse City First United Methodist Church, we honor you, and we know that the difference we make in our church and community would not be possible without you! See you this Sunday at either 8:30 or 11:00 am. And please join us in Wesley Hall for our Volunteer Celebration between the worship services! I am so thankful that we are starting year three of ministry together in Royse City! The past two years have been an enormous blessing to Tracy and me, and we pray that these past two years have been a blessing to you as you grow as disciples of Jesus Christ! You have probably heard me say that this year is a year where we will look forward to even greater things as we continue to build on what God has done in and through our church. So far this year, we’ve had close to 150 children, youth, and adults participating in Vacation Bible School; 29 new friends have joined our church; we’ve got a thriving youth ministry and children’s program; and we’ve implemented a new check-in system to keep our kiddos safe while they are growing in their faith. This is only the beginning as we continue to make disciples of Jesus Christ for the transformation of the world! As we move forward, providing a welcoming place for all persons to grow, I need a favor. The staff and worship committee has designed a worship survey; this is to help us as your leaders tweak and develop worship, so it makes a lasting impact on the lives of those in our community. We are growing, and just over the past two years, our average worship attendance has increased by 30, which means we’re averaging over 200 participants in worship on Sundays! Please take a moment to fill out this survey, https://www.surveymonkey.com/r/72887DW, and let us know your thoughts about worship at Royse City FUMC. Again, I'm so excited for this year, and I'm looking forward to seeing how we together can make a difference in Royse City because Christ has made a difference in and through us.